Kombucha scoby candy is a sweet chewy textured treat created from extra scoby "mushroom" cultures made by fermenting homemade kombucha tea. Anyone of you who are avid kombucha makers know these round gelatinous disks can definitely build-up in your refrigerator. Of course, you can always give them to family and friends to make their own gallon of kombucha, but another less known way to use them is to make "scoby candy." Yes, you can actually eat them! 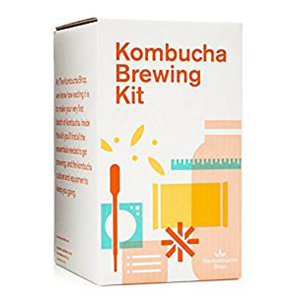 But, if you'd ever tried to take a nibble from a kombucha scoby layer, you will have realized that it doesn't have a whole lot of flavor. It's bland, rubbery and not very pleasant to eat. What we discovered, however, is that it can be marinated for a period of time in a sugary syrup made with natural sweeteners and dehydrated. This creates a chewy sweet candy-like treat that can be individually wrapped or stored in an airtight container in a pantry location. 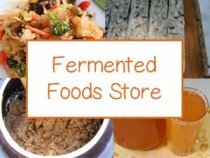 Visit our "how to make" a kombucha scoby page for instructions on how to grow your own from scratch. 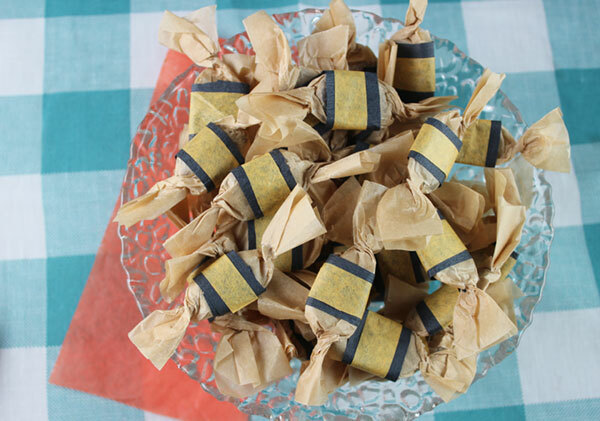 At some point we decided to add freshly ground ginger powder to the mix and came up with our own version of "ginger chews", a popular American candy. While not quite as thick as commercial ginger chews, they are just as tasty. 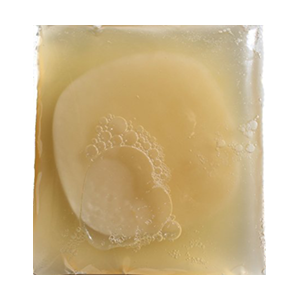 Keep in mind that these cubed kombucha scoby candy pieces contain a lot of sugar content. While they can be a good replacement for highly refined and processed candy, we do not recommend consuming them on a regular basis. And, absolutely avoid these treats if you have a low sugar tolerance or a candida infection. Kombucha drink, in general, should likewise be avoided under such circumstances. So... What is a Scoby? In case you're wondering, the term SCOBY is an acronym for the words Symbiotic Colony of Yeasts and Bacteria. 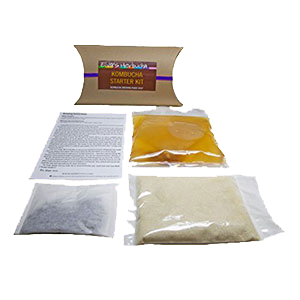 It is essentially the thick cellulose-based gelatinous mat that forms on the top of the kombucha tea liquid during the fermentation process. 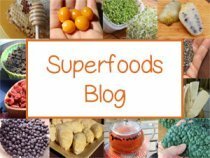 It works in much the same way as other culture starters like kefir grains used to make kefir, koji used to make miso or the Rhizopus oligosporus spore cultures used to make tempeh. It is very similar to the Acetobacter aceti or "mother of vinegar" used when making vinegar. While it is commonly called a "kombucha mushroom", it is not technically a mushroom species but a blend of bacteria and yeast strains. Not all scoby cultures, however, are made up of the same varieties or amounts of these microorganisms. 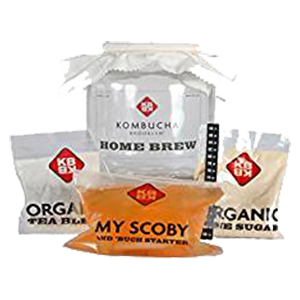 Because it is a "wild fermentation", it is important to use high quality mature kombucha scoby's that were developed in clean environments not exposed to heavy traffic, dust or debris. This will protect it from becoming contaminated with other unwanted species like candida. 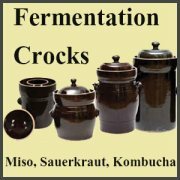 When appropriately fermented, mature scoby should ultimately contain good amounts of beneficial Lactobacillus and other lactic acid-forming bacteria as well as yeast like Saccharomyces boulardii. 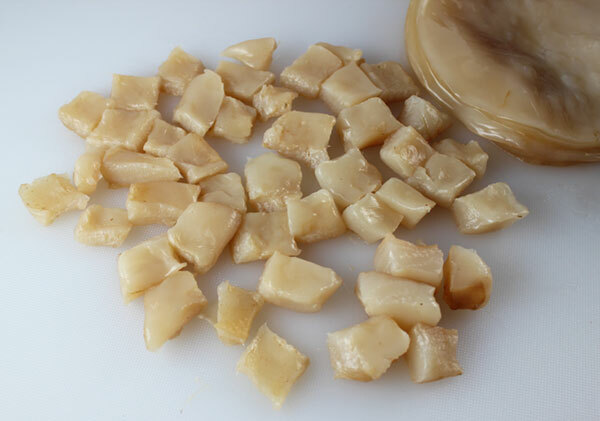 In our homemade kombucha scoby candy recipe we use very little heat, compared to other traditional recipes. This helps to ensure these live cultures are still present. The most appropriate time to make use of your scoby rounds are when they are approximately 1/2 an inch (1.27 cm) thick. Sometimes they develop unevenly, with a thickness that may vary, but thinner pieces can still be used. Boiling - This is the traditional procedure using the same process when making "nata de coco", a Philippine candy made from the gelatinous thick layer that forms on fermented coconut water. 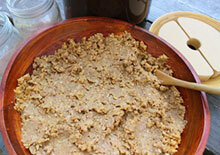 It basically requires a series of repeated water-soaking, straining and boiling of the pieces of chopped scoby. These steps are done too remove some of the acidity. The cubes are then again boiled in a sugary syrup for about 15 minutes, drained and allowed to cool. They are usually baked in an oven to cook and caramelize. Boiling/Dehydrator - This is the same technique used above, but instead of an oven one uses a dehydrator on low temp for 8-16 hours, depending on thickness of the scoby. This removes moisture content and allows it to harden into chewable candy. Soaking/Dehydrator - This is the method we use and, if you have a healthy scoby culture, you will retain more probiotic benefits using this technique. It is also suitable for those following a raw vegan diet as there is no high heat boiling or cooking involved. 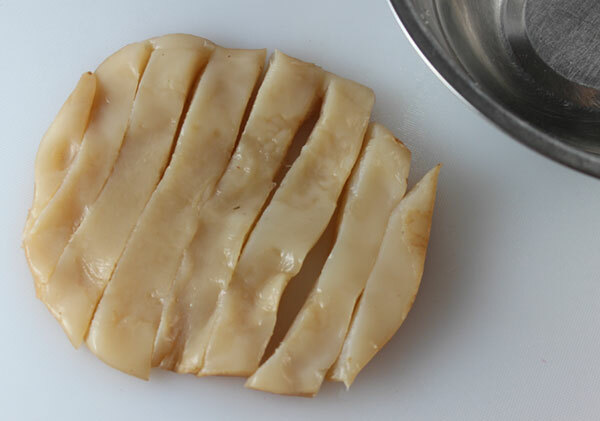 The kombucha scoby candy pieces when dehydrated will reduce their size and flatten quite a bit from the original cube shape, so keep this in mind when slicing them up. 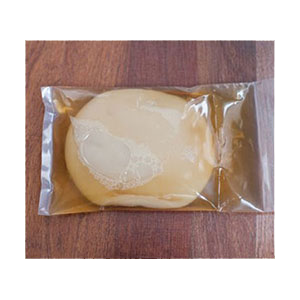 Rinse your scoby round and remove any film or loose stringy bits. 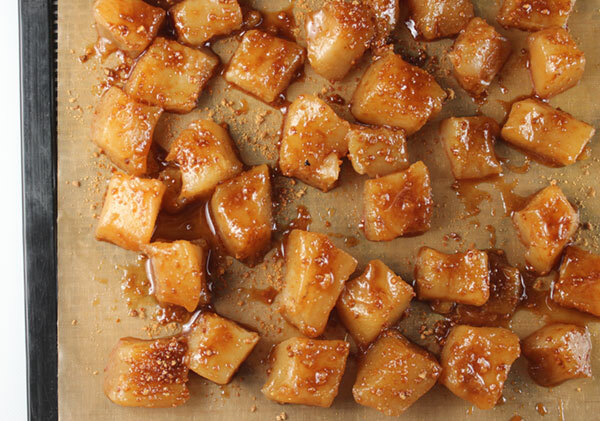 Chop your scoby culture into bite size cubes with a serrated knife. Soak in pure filtered water for about 8 hours. 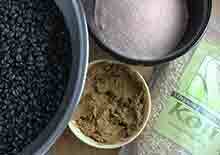 This will remove some of the acids but keep other beneficial elements intact. Now your scoby is ready for preparing in the recipe below. 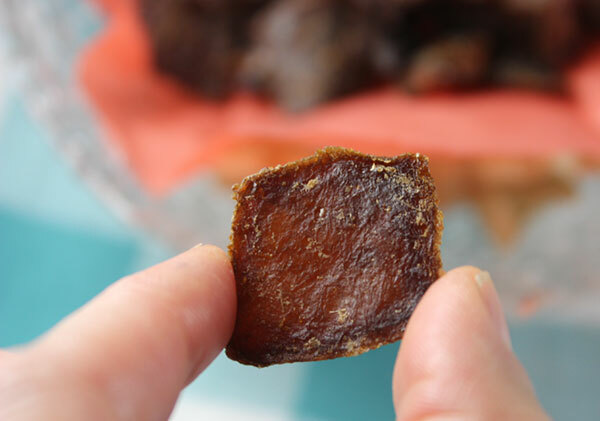 For this homemade kombucha scoby candy recipe you will be marinating your cubes in a gingery blended syrup made from raw honey, dates, coconut sugar and stevia. You can, of course, use fresh grated ginger root if preferred, but double the recipe proportions. Fresh ginger tends to give you more of a fibrous coating, so we usually dry our own root pieces and grind them down into a powder before use. 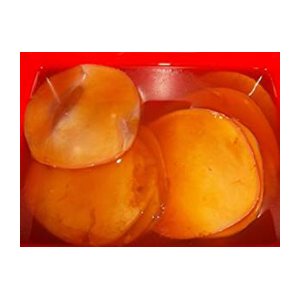 One half-gallon size scoby culture when chopped is roughly the equivalent to one cup. Here are the ingredient equivalents depending on how many extra scoby's you happen to have. 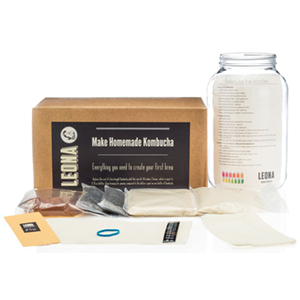 After you have initially prepared your scoby pieces using the procedure above, you can now make your marinade by blending the above syrup ingredients. In a bowl, pour over your strained scoby cubes and allow to sit covered at room temperature for about 8 hours or overnight. Strain and mix with coconut sugar, saving some to sprinkle over the top. Lay out on a dehydrator tray with a screen and sheet underneath. Sprinkle with remaining coconut sugar. Dehydrate on low temperature setting for about 12 hours or until desired chewy consistency is achieved. This will of course depend on how thick you slice them. It is important not to over-dehydrate them. You want them somewhat soft and pleasantly chewable! 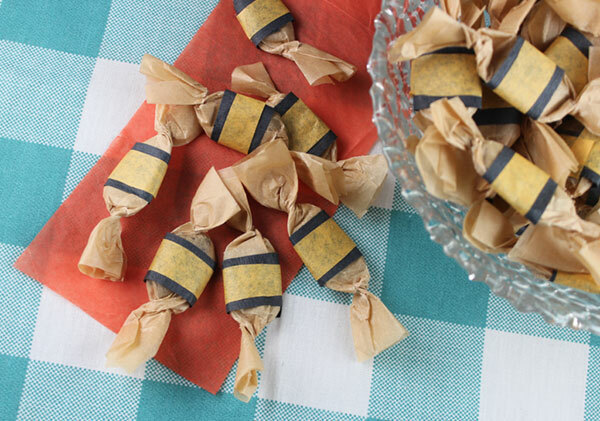 Peel off your ginger chew pieces and store in an airtight container or wrap your candy in parchment paper. After dehydrated they turn a darker caramel color. We like to individually wrap them and display in a decorative bowl as a side table snack. In the end you should have a spiced, sweet chewy live cultured kombucha scoby candy to eat, share or give as gifts to fellow kombucha lovers.